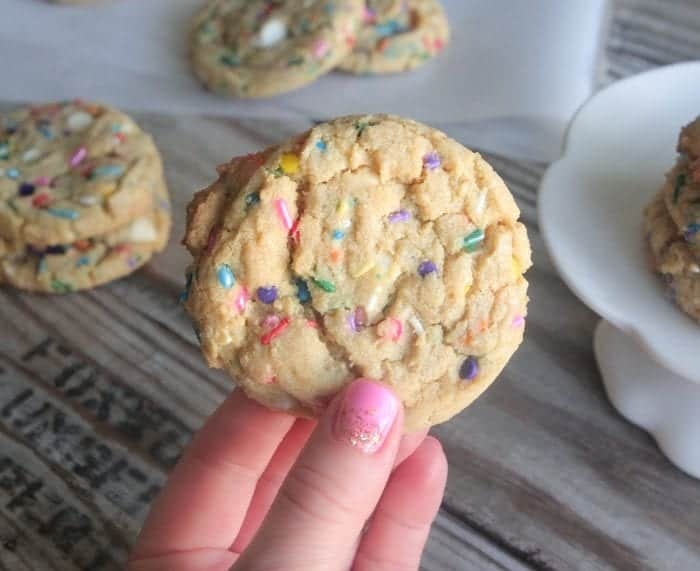 These Funfetti White Chip Cookies are so pretty served on a cookie plate and have the best texture, a hit every time! 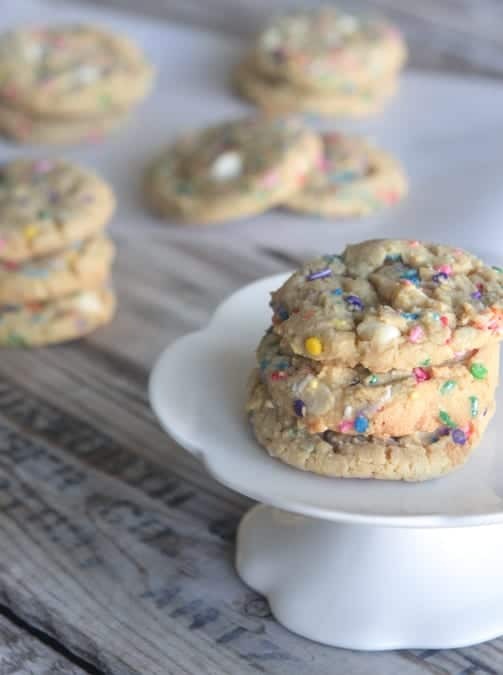 You are in for the ultimate treat with my Funfetti White Chip Cookies! 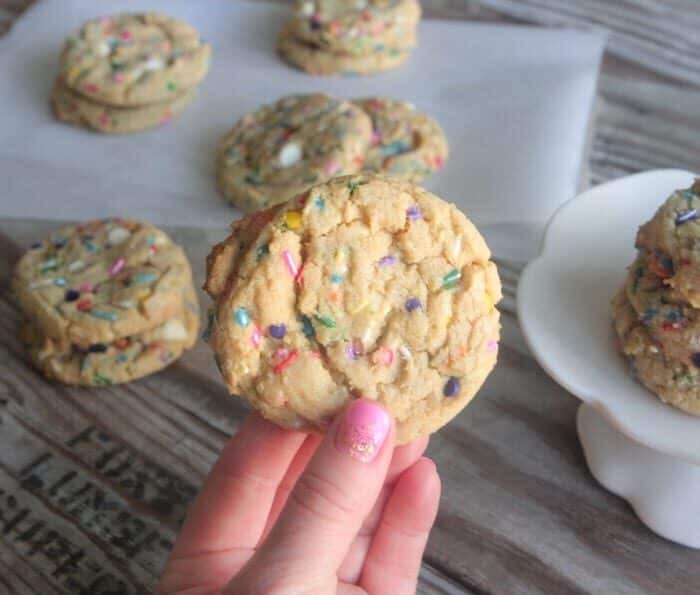 My oldest son declared these his second all-time favorite cookie with my lemon white chip being his first favorite 🙂 The funfetti throughout makes the perfect cookie to bring to celebrations. Everyone loves the fun colors. Hope you enjoy! You’ll start by creaming your sugars and butter until well combined. You’ll add your egg and vanilla up next. Dry ingredients into the bowl. 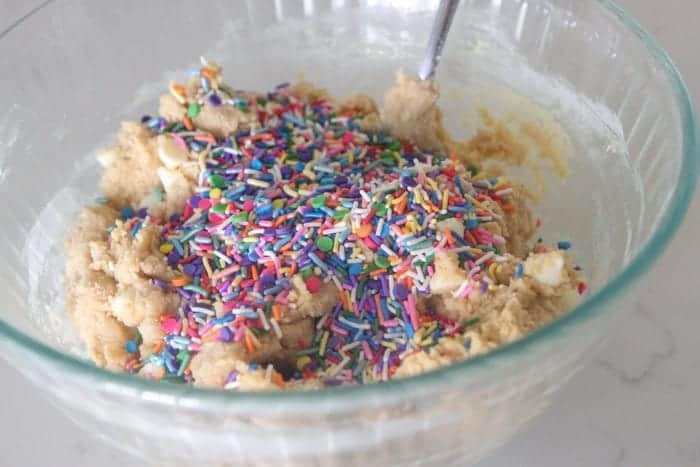 Add your white chips and favorite colorful sprinkles. I like to describe these as crispy soft. Perfect buttery edges with chewy center. The best! Enjoy! 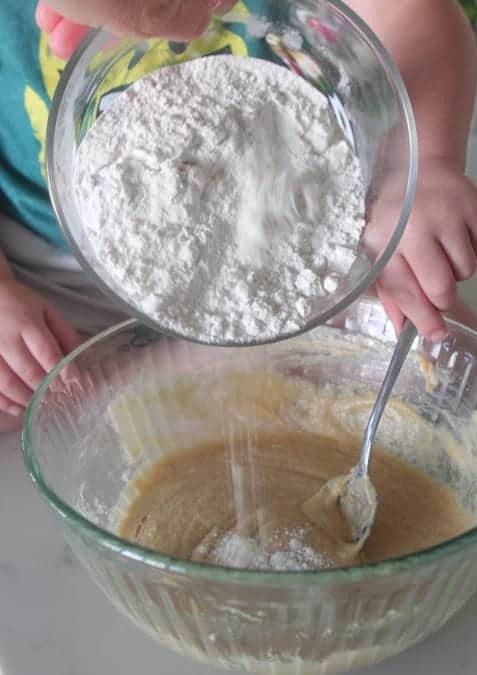 For more Picky Palate cookie recipes click HERE. Make sure you are following Picky Palate on Instagram where you can get sneak peeks of what’s coming to the blog! 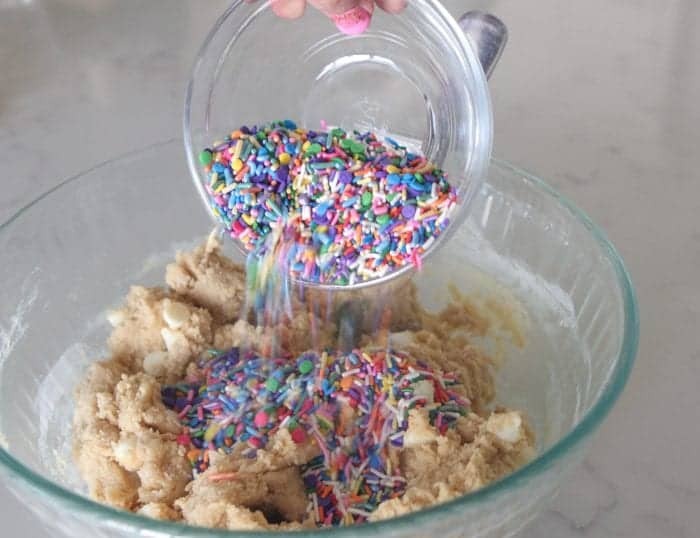 *Use whatever colorful sprinkles you have on hand for an adorable colorful cookie. *Dough may be made ahead and frozen, just place into an airtight tip top bag or container. Preheat oven to 350 degrees F. and line a cookie sheet with parchment paper. 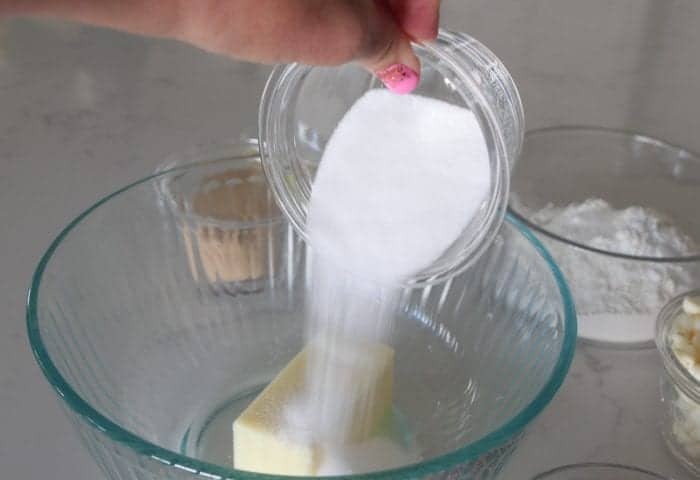 Cream butter and sugars into a large bowl or stand mixer. Add egg and vanilla mixing to combine. 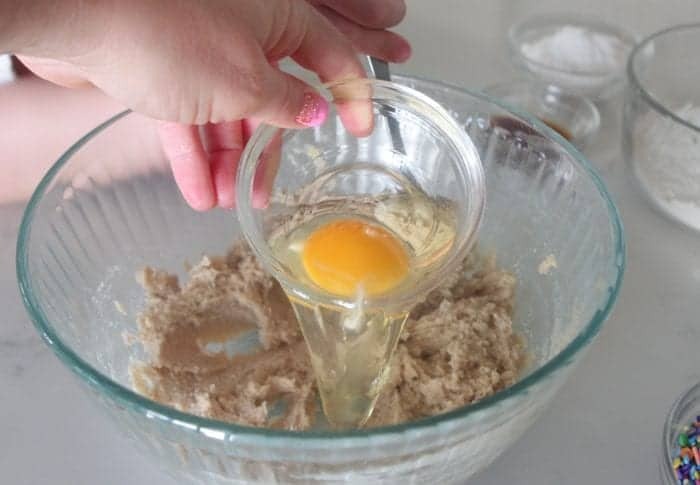 Slowly add flour, baking soda, salt, and pudding mix, mixing until dough forms. Stir in sprinkles and white chips. Scoop dough onto baking sheet about 1 inch apart. Bake for 13-14 minutes until edges just start to crisp. Remove and let cool before transferring. Serve room temperature. 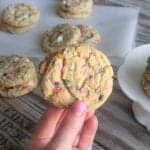 Funfetti AND white chocolate?! Divine. These are perfect for events with my kids! My family’s going to love these! Look at all those sprinkles. So fun! 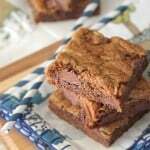 Can you check the recipe on this to make sure it is correct? I like your recipes and normally have great luck with them, but these did not turn out well. They are super flat and with the sprinkles and white chocolate chips they look terrible! Nothing like the picture. I followed the recipe and even cooled my dough behforehand, so I don’t know why they did not turn out. I made these cookies, and they tasted great, but mine turned out flat, any suggestions?